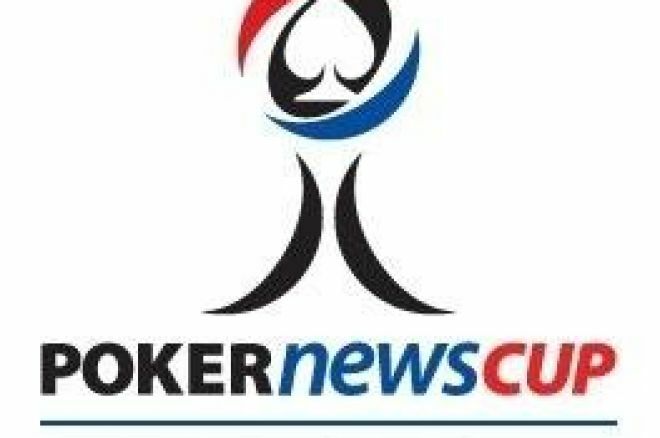 Austrian Erich Kollmann made short work of his remaining opponents, taking down the PokerNews Cup Austria Main Event in just over four hours of final-table play. Kollmann started the day with a significant chip lead over his nearest competitor, Portugal's Hugo Felix, and finished the day without ever having to play a single hand heads-up. Short stack Rudolf Russegger was the first to fall, as he and Jordy Veenboer got into a battle of the blinds. Veenboer completed his small blind, and Russegger check his option to see a flop of . Veenboer fired at the pot, and Russegger quickly raised. Veenboer re-raised all in, and Russegger called, putting all his chips in the middle with on the very first hand of the final table. Veenboer tabled , the turn and river ran out , and Russegger was eliminated in eighth place (€4,090). Christian Wissmann moved all his chips in from the button with , and Andrew Nicholson insta-called with . Wissmann picked up a jack on the flop, but the turn and river came down , and PokerNews.com freeroll qualifier Wissmann picked up €5,260 for his seventh-place finish. Werner Lorenzoni went to the rail in sixth place (€6,430) when he moved the last of his stack into the middle with and found one caller in Niki Kovacs with . Kovacs' threes held up on a board of , and Lorenzoni was busted. Jordy Veenboer exited in fifth place (€7,600) when he and Nicholson tangled in another blind vs. blind battle. Veenboer limped in from the small blind and Nicholson checked his option with . The flop came down , and Veenboer led out. Nicholson called, then fired as the came on the turn. Veenboer called, then moved all in on the river. Nicholson insta-called with his straight, and Veenboer tabled for two pair as he was eliminated. Hugo Felix tangled with chip leader Erich Kollmann, and went home in fourth place with €9,350 to show for it. Felix defended his big blind with against the aggressive Kollmann, then both players checked the flop. Felix led out when the came on the turn. Kollmann thought for a long moment before re-raising, followed by Felix moving all in over the top. Kollmann called quickly with for trips, and the on the river sent Felix to the rail in fourth place. Soon after, Niki Kovacs and Andrew Nicholson got it all in preflop on what turned out to be the final hand of the tournament. Kovacs raised from the small blind and Nicholson put out a stiff re-raise. Kovacs moved all in with , and Nicholson quickly called with . The flop was good for Nicholson, as it came down . The turn gave Nicholson a full house and left Kovacs drawing dead, and Kovacs picked up €11,690 for third place. After a brief negotiation, Nicholson and Kollmann reached a deal about the prize money and Kollmann was declared the PokerNews Cup Main Event Champion.